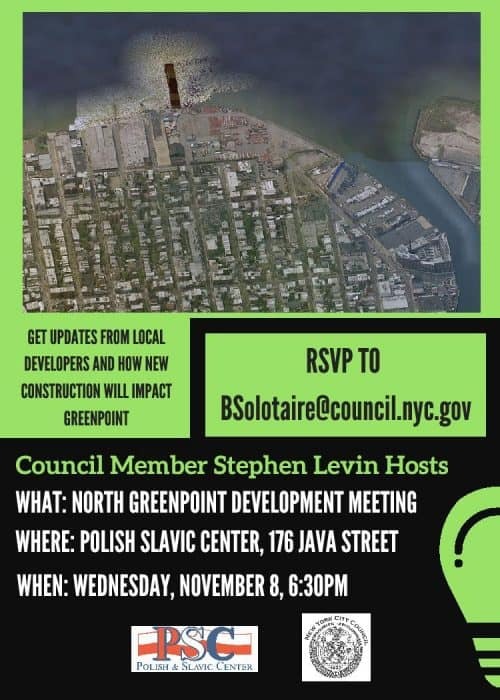 New York City Council Member Stephen Levin is hosting a North Greenpoint Development meeting at the Polish Slavic Center (176 Java Street) on Wednesday, 11/8 at 6:30, where community members can engage with local developers around how new construction in the neighborhood will impact Greenpoint. Who: Anyone interested in, curious, or concerned about how new construction will impact the neighborhood. The 94th Precinct will hold a community meeting tomorrow (10/4) at St. John’s Lutheran Church (155 Milton Street) at 7pm. The meeting is a monthly opportunity for community members to connect with local officers and express area concerns. This is a community-wide meeting, covering all NCO sectors, and all are welcome. Mark your calendars, Greenpointers. The next Newton Creek Community Advisory Group (CAG) meeting is coming up soon on Thursday 2/6 at the McCarren Play Center (776 Lorimer, right near the pool) at 6:30pm. The meeting with feature presentations from the NYC Department of Environmental Protection (DEP), the lovely folks who are in charge of our own little Superfund site. 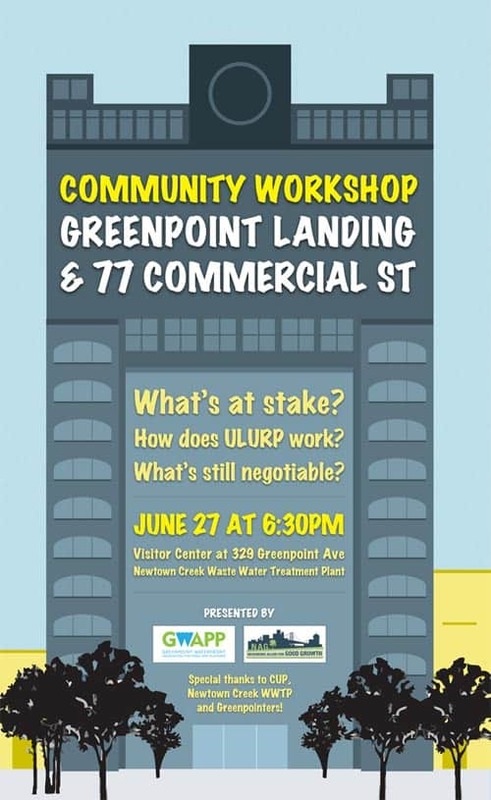 They’ll discuss the city’s role in the Superfund process, upcoming plans for Newtown Creek drainage (mmm! ), and all the other fun-filled aspects of environmental restoration along the creek. So if talking about toxicity and soil remediation really gets you going, save the date. We’ll be right there with you. 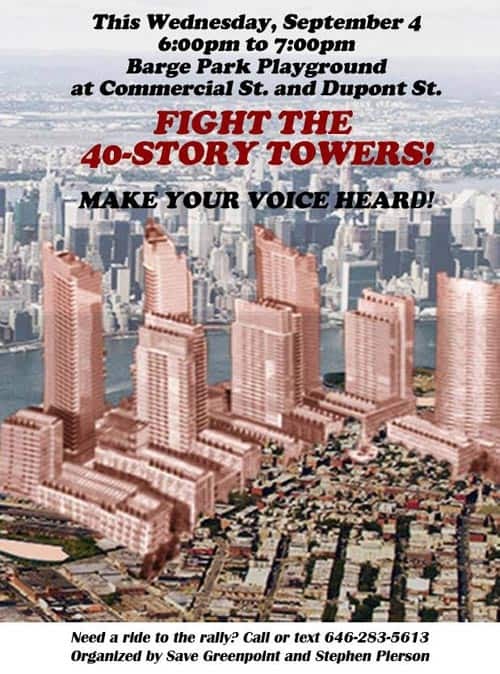 Last Thursday was Greenpoint Community Environmental Fund’s third meeting since the $19.5 Million settlement with ExxonMobil – funding which will be granted to environmental projects only within the 11222 area code – that’s us Greenpoint! 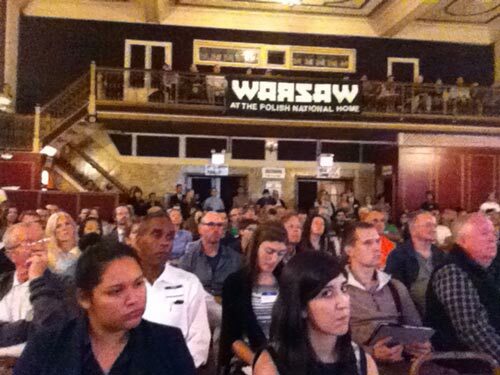 The meeting at the Warsaw was well organized and very informative. There was a vibrant and packed house of community members and organizers who were eager to learn how to apply for funding. ExxonMobil was not present and it was mentioned that they were asked not to attend the meeting as they don’t have a say in how the funds will be used. Highlights were at the end of the meeting, during the Q & A – obviously. One young woman stood up and spoke about her non-profit that aims to create a spiritual synergy with the environment, which got a priceless eyeroll from a woman in a Jets Jersey. More importantly questions were asked in regards to bio-remediation projects and Stephen Levin mentioned the importance of funding for public health surveys. 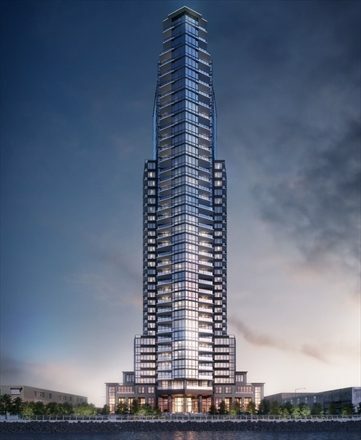 The meeting broke up when an elderly man stood up and ranted about the waterfront towers, asking if they are for the rich and whether normal people will get screwed. Gotta love it! 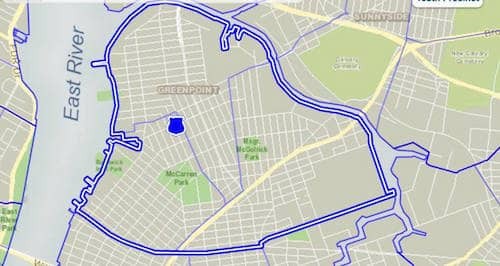 Interested in how you can help make Greenpoint more, well…green? 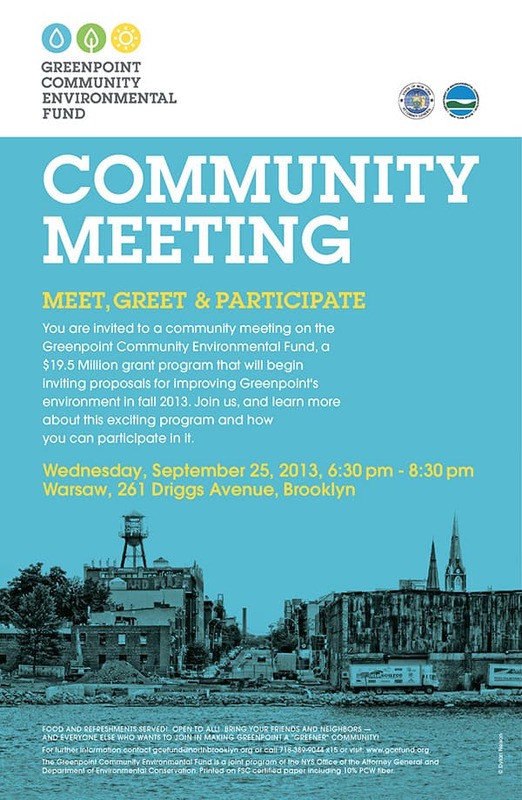 Join the community on 9/25 to get involved in the Greenpoint Community Environmental Fund, a $19.5 million dollar grant program that will be accepting proposals to improve the Greenpoint environment this Fall. The $19,500,000 was obtained by the State of New York in a settlement with ExxonMobil in 2011, which required the company to clean up the oil and related environmental contamination that it caused during the Greenpoint Oil Spill. It is the largest single payment of its kind in New York history. In the late 1970s, oil spills from ExxonMobil’s Greenpoint refinery and storage facility were discovered seeping into Newtown Creek, creating a plume of oil on the water’s surface. Some of this oil dissolved in the groundwater and contaminated surrounding soil. 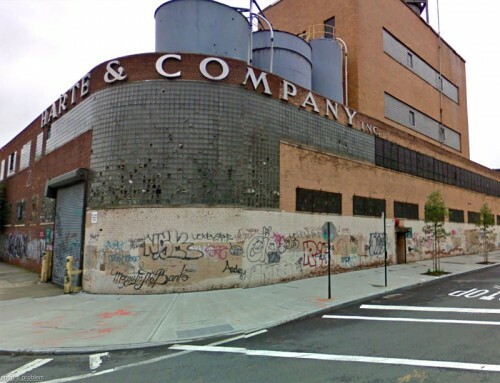 It is estimated that at least 17 million gallons of oil were released underneath Greenpoint, leaving at least 55 acres contaminated. Improvements will be geared towards local environmental issues such as water quality, groundwater, open space, reduction of toxic pollution, and air quality. The settlement only covers land clean up, since the creek itself is a Superfund site and is therefore being handled by the Federal government. More info is available from the Office of the Attorney General. The meeting will take place at Warsaw (261 Driggs Ave) at 6:30pm.